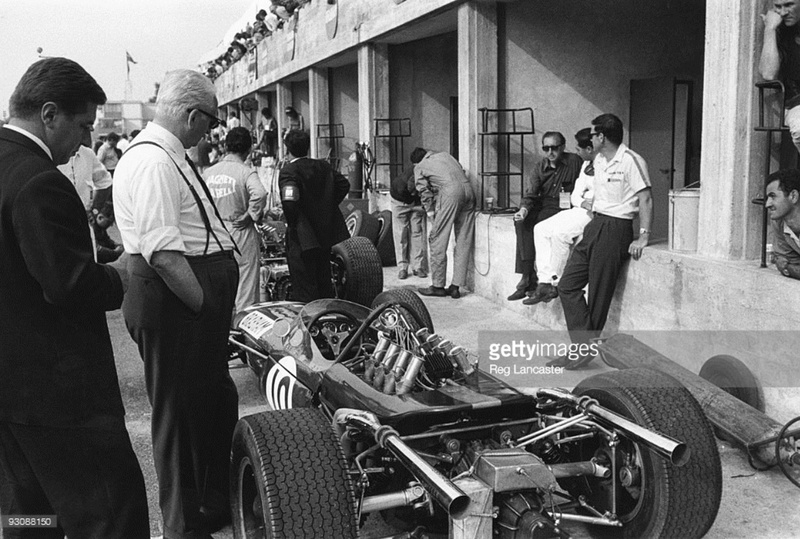 ‘Big John’ is probably feeling fairly confident at this point, Ferrari seemed to be as well prepared as they had been for the last formula change from 2.5 to 1.5 litres in 1961. They took the title convincingly of course, Phil Hill won it in the Carlo Chiti designed ‘Sharknose’ 156 V6. Coventry Climax had withdrawn as an engine provider at the end of 1965, other than some transitional support of Team Lotus with a couple of 2 litre FWMV V8’s to tide them over. 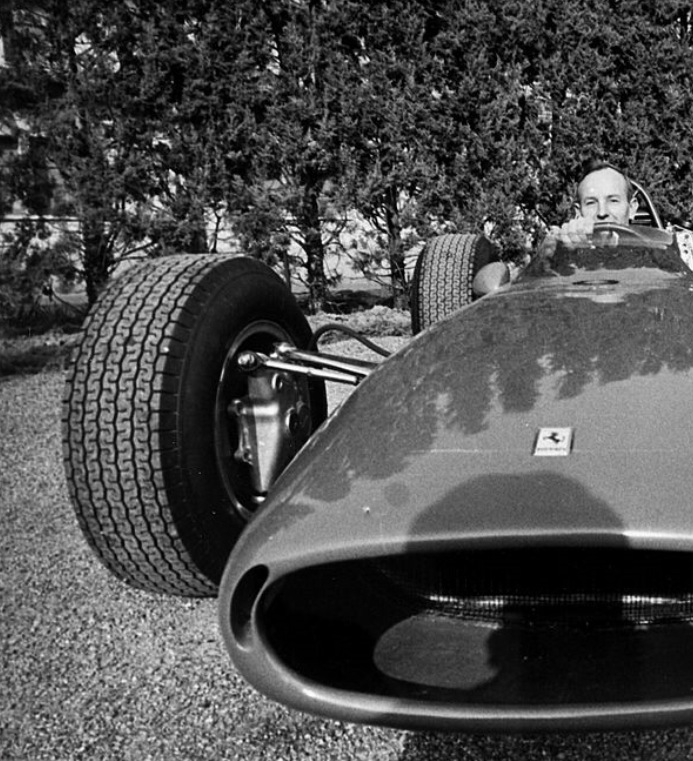 Generally, 1966 was a year of transition and therefore of opportunity for those who started the season with a fast, reliable package, the Ferrari seemed just that. ‘Down Under’ Jack Brabham installed the first Oldsmobile F85 blocked Repco Brabham ‘RB620’ V8 into a year old Brabham chassis, BT19, built for the stillborn Coventry Climax Flat-16 engine and contested the Non-Championship South African GP at Kyalami in it on 1 January. Repco then popped a 2.5 Tasman Formula RB620 V8 into BT19 for a couple of Tasman rounds, at Sandown Park and Longford, each time learning a little more about the engine and making it reliable. 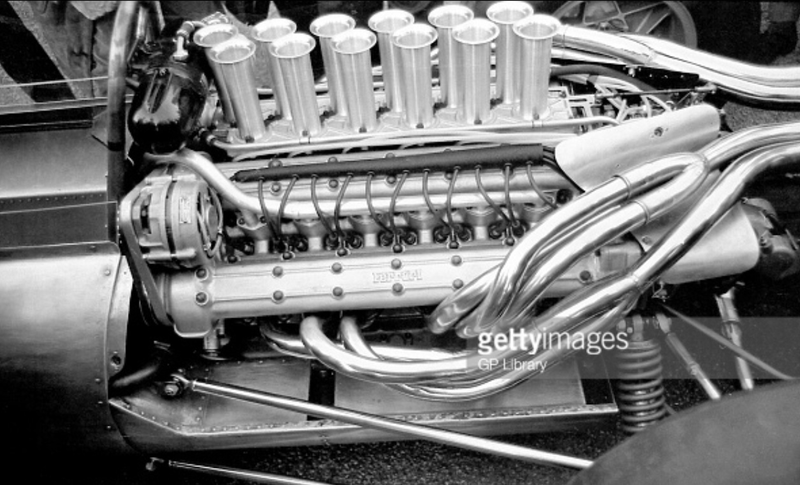 Ferrari’s own 3 litre V12 was a trusty old warhorse which had served them well. It was a reliable Le Mans winning unit and more powerful than the Repco V8 but the car was heavy. 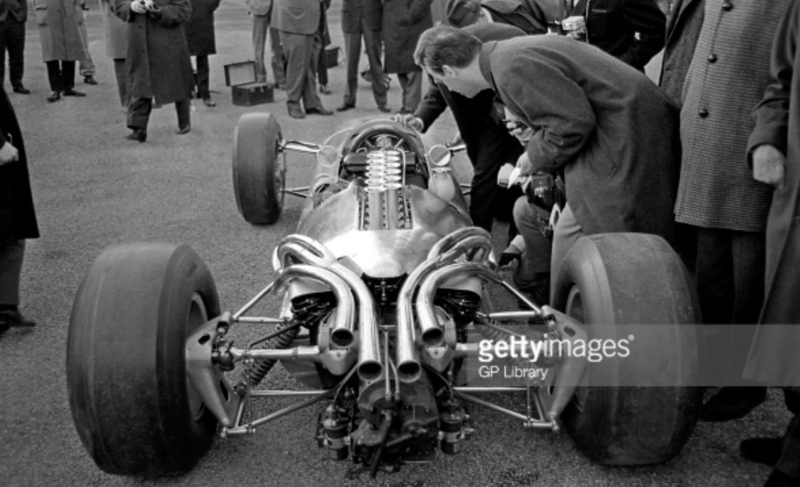 Brabham’s BT19 was a light spaceframe and his 300 horses were stallions not geldings. The first GP of the new F1, the 1966 XV Gran Premio di Siracusa was on 1 April, Surtees won it in a 312 from teammate Bandini’s Ferrari Dino 246. The only other ‘new’ F1’s were the Cooper T81 Maserati’s of Jo Siffert and Guy Ligier both of which failed to finish. So too did Brabham’s BT19 with a Repco failure. On 14 May the teams met at Silverstone for the XVIII BRDC International Trophy which Brabham won from Surtees and Bonnier’s Cooper T81 Maser. Off to Monaco for the first Championship round on 22 May, Jackie Stewart’s BRM P261 took the race from Hill’s P261 both cars with 2 litre versions of the old P56 V8 1.5 litre F1 engine, and Bandini’s Dino. Surtees and Brabham were out on laps 16 and 17 respectively with transmission dramas. Bandini’s use of the Dino which as the teams #1 Surtees should have been allowed to race, in Johns assessment the better of the two cars for the unique demands of Monaco, was one of many dramas within the team which famously resulted in the headstrong Brit telling Ferrari to ‘shove it’ costing both a title which they may well have taken. 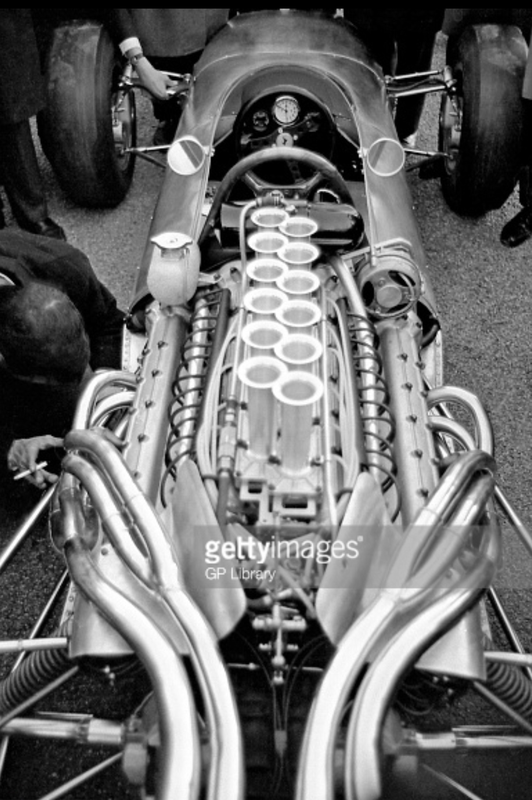 The heart of any Ferrari is its engine of course, and what a glorious thing the Tipo 218 unit was. Cast in aluminium alloy with cast iron wet cylinder liners, the 60 degree V12 had dual chain driven overhead camshafts per bank operating 2 valves per cylinder. The compression ratio was 11.8:1, heads incorporated 2 plugs per cylinder which were fired, old school, by a battery of 4 coils. The engine was dry sumped, the cylinders fed by Lucas indirect fuel injection. Claimed output was circa 360bhp at 10,000rpm, the reality probably a little less than that. The engine wasn’t really the cars weakness, it was probably more so the Tipo 589 chassis’s overall weight. 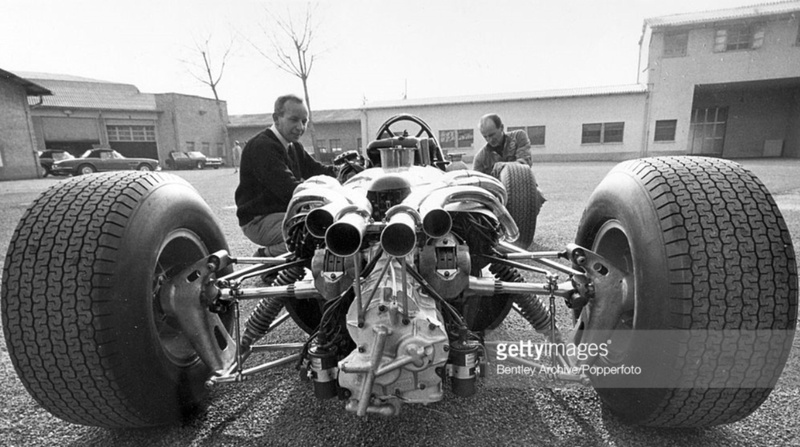 Ferrari really didn’t get the hang of building a modern monocoque in the British idiom until they contracted John Thompson to build them one circa 1973! Before then their tubs were sheet aluminium panels in a double wall riveted to a tubular steel structure. It was effective but heavy. The Ferrari’s suspension, as you can see is period typical; inboard at the front with a top rocker and lower wishbone and outboard at the rear with a single top link, inverted lower wishbone with forward facing radius rods for location. Uprights were cast magnesium with coil spring/shock units. Girling provided the disc brakes, which were inboard at the rear. The Tipo 589 5 speed transaxle was sportscar derived, beefy and heavier than the DG300 Hewland box which became ‘de rigour’ in the Pommy cars of the era. Shot above shows the beautiful standard of Ferrari fabrication and finish. Note the chassis, Lucas injection, twin-plug heads, alternator driven by the cams and wonderful exhausts which are fine examples of the pipe-benders art. In fact the following day was a good one for the Scuderia, Ludovico Scarfiotti’s 312 V12 took the win from Mike Parkes similar car with Denny Hulme’s Brabham BT20 Repco third.